It's a virtual truism that both nightclubs and raves look terrible on film. That notion ends with Beats, which features a mid-90s rave so ecstatically evoked that it seems to blow a hole in the screen. Adapted by Kieran Hurley from his own play (originally performed at Glasgow's Arches theatre) and co-written by director Brian Welsh, Beats feels stagy and undercooked in places, but any doubts are erased by the head-trip of an ending. Teenagers Johnno (Cristian Ortega) and Spanner (Lorn Macdonald) are friends standing on the edge of separation when Johnno's staid parents (Laura Fraser and Brian Ferguson) announce they're moving house. The boys plan a trip to an illegal rave, but Spanner gets caught stealing cash from his bullying brother, who pursues him. And Johnno never imagines that his own policeman father will be amongst those deployed to break up the illicit gathering. The set-ups for Beats betray its theatrical origins; the details of Johnno and Spanner's lives seem improbably contrived before they start raving. But Ortega and Macdonald's performances are so vivid that it's a shame that the black and white photography may well relegate this drama to cult status; there's nothing about the setting that merits such a deliberately arty presentation. 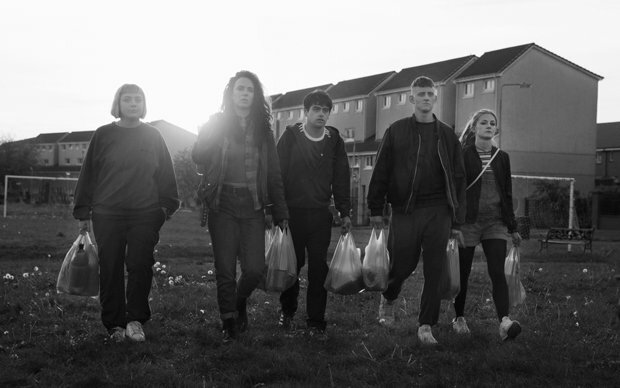 Given that it's funded by Creative Scotland and the BFI, it has a surprisingly pro-drugs message, portraying Class As as an essential coming-of-age experience for teenagers, although there's an awkward contradiction in the depiction of drugs as harmless fun but dealers as sinister scumbags. Nonetheless, as a rave simulator, Welsh's film features an array of well-chosen tracks and club visuals turned up to the max. Anyone nostalgic for glow-sticks and whistles will find the euphoric climax leaving them begging for one more tune. Screened on Sun 3 Mar as part of the Glasgow Film Festival 2019. General release from Fri 17 May.